What are Wisdom Teeth and Why Should You Remove Them? Many people have already been through the process of wisdom teeth removal. However, not everyone has to experience this painful procedure. Today we are going to answer some of the most common questions patients ask dentists about wisdom teeth. What are wisdom teeth? Does everyone need wisdom teeth removal? What are the benefits of removing wisdom teeth? And lastly, what is the process of wisdom teeth removal? Wisdom teeth are the third and final set of molars. Most people get their wisdom teeth in their late teens or early twenties. The age at which wisdom teeth present themselves is what gives them their name. After all, we are all very wise in our late teens and early twenties. 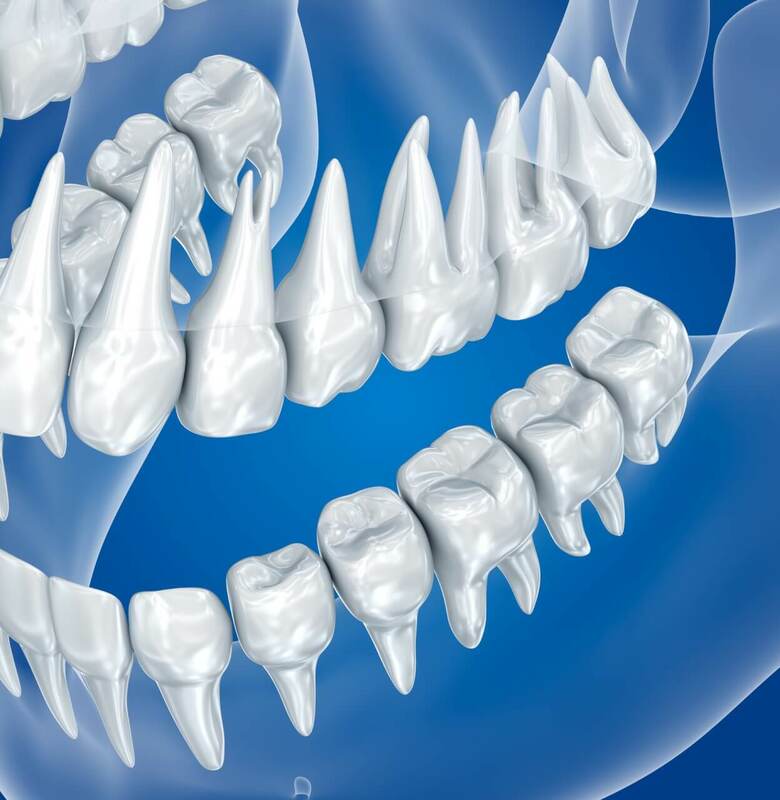 Anthropologists believe the wisdom teeth were a necessary evolution for our early ancestors. The diet of the times included coarse, rough food like nuts, roots, leaves, and meats. These foods required more chewing power, and therefore our bodies evolved. Scientists now consider these teeth functionless because of our evolution. Not everyone has wisdom teeth. There are some people out there who are lucky enough to benefit from a random gene mutation. This mutation has spread throughout some of the population. Luckily for these people, wisdom teeth are useless to modern day humans. The short answer is no. There are some people that have enough room in their mouths to accommodate their wisdom teeth. These people are luckier than those that have no wisdom teeth at all. They get all of the benefits of having wisdom teeth without the painful experience of wisdom teeth removal. People that have misaligned wisdom teeth must have them removed. The teeth may position themselves horizontally, at an angle toward or away from the second molars or outward or inward in the mouth. Misaligned wisdom teeth can cause serious issues for your other teeth. There is only so much room in your mouth, and if your wisdom teeth take up too much room, other teeth must move to accommodate them. The other issue is that wisdom teeth can be impacted. This means that they are enclosed within the soft tissue or the jawbone. This is the most common cause for concern when it comes to wisdom teeth removal. So, ask your dentist to check whether your wisdom teeth are misaligned. Your dentist can help you determine the best way to proceed by taking an x-ray of your mouth. The probability that misaligned teeth will cause serious issues is high. If your teeth are misaligned removing them can prevent further issues down the road. Prevention of gum disease and a reduction in pain are two of the most common benefits of wisdom teeth removal. However, removing your wisdom teeth doesn’t come without a price. You can expect a fair amount of bleeding within the first 24 hours after removing the teeth. A moist tea bag can help the blood clot quicker. Another common side effect of wisdom tooth removal is facial swelling. It isn’t uncommon to walk around looking like a chipmunk for the first few days after the procedure. Both of these symptoms are normal. However, if they persist for more than a day or two, you will want to contact your dentist. You will also want to be aware of the two complications of tooth extraction. The first complication is what is known as a dry socket. A dry socket occurs when a blood clot fails to form or is dislodged. Without clotting, there will be a delay in the healing process. The symptoms of a dry socket include pain and a foul smell coming from your mouth. The second common, rarer, complication is what is known as paresthesia. Paresthesia is numbness resulting from damage to a nerve. This numbness can last a few days, weeks, months, or it can even be permanent. To avoid these complications and further procedures, you will want to heed all of your dentist’s advice. The first step of extracting wisdom teeth is to take an x-ray of your mouth. This x-ray will allow you dentist to determine how complex of dental surgery you will need. Next, you doctor will give you an anesthetic. Lastly, the dentist will remove any of the problem teeth in your mouth. There will be some pain, but your dentist will reduce the intensity of the pain as much as possible. If you are not sure about wisdom teeth removal, speak with a dentist, and they can help you determine whether or not you need yours removed.